Once again the city of Stockholm invaded its neighbour, Norrtälje. 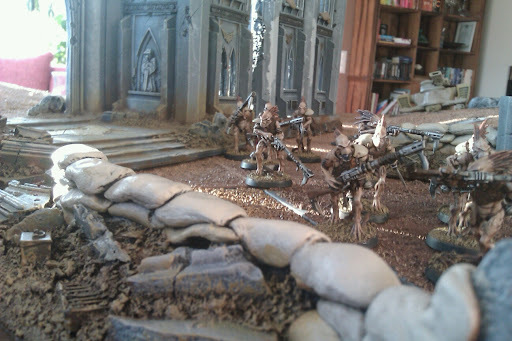 The gallant Death Korps stood vigil against marauding Plague Marines and filthy Tau. First out was Nicklas, ready to bludgeon the stoic Death Korps to pulp. 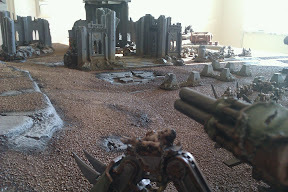 But even with a Defiler, a Vindicator and two Blight Drones it was an uphill battle for our resident Chaos player. 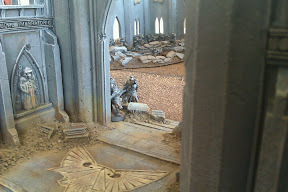 A single guardsman is easy to kill, but in numbers they do the Emperor justice. And since Nicklas had only eleven footsloggers and four light weight tanks, Johan had none of the troubles of choosing the right targets for his many guns. Nicklas had to stand next to an uncontested objective to win and they started on the short sides of the board, so a long trek for the Plague Marines. A fun fight to watch. 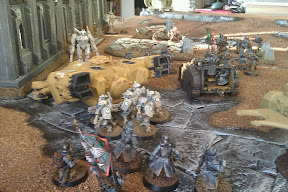 The next fight my Tau got to bring their big guns out. 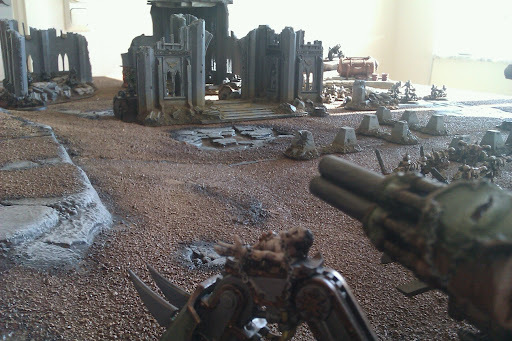 But rail guns really don't do themselves justice against infantry armies, but Hammerheads do shine. And thanks to my really killy leader I managed a draw. We played a fight with three missions, (you can find them, and others, here http://www.msu.edu/~steinerp/CompletedMissions.pdf., thanks to the guys at Fight Club ) First one was standard kill points, the second was to eliminate the leader of the opposing force and the third was to kill the other leader with your leader. I lost the kill points, but my leader blasted the Death Korps colonel into tiny bits granting me a draw. 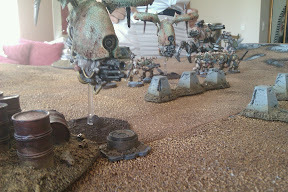 A fun fight and its great to take up the Tau once more. It was a lovely day. Just what I needed. There nothing better then a draw or an almost draw. Both of the games were superfun! Like the pics. Nice nice supernice. A great day, even though the heat and beer made me tired. More suits for me! And more fire warriors, don't like to face those cowardly suits. But I love the mini. It brings great joy to my heart, to se your Tau in action again! Me too, tau are wonderful! I've begun construction of my Hazard, its awesome! More suits, for the Greater Good!